It was a topic that consumed us for the better part of this year: whether Boston should host the 2024 Summer Olympics. But it wasn’t meant to be. On a hot July morning, a somber Boston Mayor Marty Walsh called a hastily arranged press conference to tell the world that he wasn’t ready to bet taxpayer money to guarantee the Games. The Boston bid collapsed before the day was done. As 2015 comes to a close, it’s worth asking: What was the point of all this? Will our collective hand-wringing amount to anything? With our official bid and the kind of deadline that drives action from government gone — now what? To get their take on those questions, I invited John Fish, Boston 2024’s original chairman, and Chris Dempsey, who helped lead the grass-roots coalition to fight the Olympics bid, to sit down with me at the Globe. It was their first face-to-face meeting since Boston ended its improbable quest. For his part, Fish hangs onto hope that the millions of dollars and countless hours spent on a plan for Boston’s future will pay off. “When history is written, I think there will be a powerful bid legacy,” says the 55-year-old Suffolk Construction chief executive who rallied business leaders to organize the bid. Fish and Dempsey are the Globe Magazine’s Bostonians of the Year for this reason: Whether you were for or against the Olympics, the pair got the whole region talking about what the city’s future should look like and how we could get there. After its nod from the US Olympic Committee, Boston spent seven months on the world stage, mentioned in the same breath as Paris and Rome as contenders to host the sports extravaganza. Then almost as quickly as we got the go-ahead, we were out of the race, not beaten by a competitor, but suffering a loss brought on by ourselves. Los Angeles eagerly took our spot. So here comes the hardest question: Has Boston missed its chance to create an Olympic legacy, one that leaves it in better shape than it has ever been, boasting new or revitalized neighborhoods, a stronger transportation system, another stadium? In Fish’s mind, the discussion identified priorities we can all agree on — the need for a stronger regional transportation system, more middle-class housing, and investment in parts of Boston that have been left behind, such as Dorchester’s Harambee Park and Franklin Park’s White Stadium. Along the way, the bid uncovered opportunities to rejuvenate neighborhoods from Widett Circle to South Boston’s Dorchester Avenue. Even in a town as small as Boston, the two had never met until they tangled over the Olympics. In local business circles, Fish is as ubiquitous as the Suffolk Construction banners that hang all over towers going up in Boston. With seed money from his father, Fish forged a $2.7 billion empire, and it has been no secret he set his sights on becoming the next Jack Connors, the Boston advertising executive who has long shaped business, civic, and philanthropic agendas in town. Fish didn’t need the Summer Games to become heir apparent to Connors, but the construction king championed the idea of Boston as host two years ago, believing he could do something transformative for the city while creating a legacy of his own. Dempsey, meanwhile, had weaved in and out of the private and public sectors. He spent three years with the state Transportation Department, including a stint as an assistant secretary for innovation. In 2010, he went off to get his MBA from Harvard Business School. Afterward, he dabbled in politics, working as a policy director on Joe Kennedy III’s successful run for Congress, and then joined Bain Co. as a consultant. 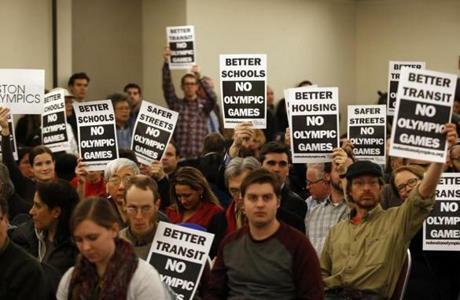 At a community meeting last February on Boston’s Olympic and Paralympic bid, activists make it clear which side of the contentious issue they are on. Dempsey helped launch No Boston Olympics under the belief that the region didn’t need to throw the world a party to be great — and that we could achieve a better T and more housing on our own terms, not ones dictated by an international organization that sticks host cities with the bill. Just as Dempsey was making headlines with No Boston Olympics, Bain was doing pro bono work for Boston 2024, the group Fish helped establish. Dempsey left Bain in March, and while he insists his departure was unrelated to his anti- Olympics campaign, you have to imagine things got awkward at the office. For Fish and his group, the high point of our short-lived Olympic bid came on January 8, when the USOC picked Boston over Los Angeles, San Francisco, and Washington as the US nominee. But it was downhill from there for the pro-Olympics camp. A bad winter exposed the frailty of the T, raising questions about how we could possibly host throngs of visitors when our public transit system couldn’t even handle snow. Some neighborhood groups felt blindsided by proposals for venues in their backyards. No Boston Olympics drilled into our heads the risk for taxpayers to be on the hook for billions of dollars of cost overruns. Then there were the WBUR/MassINC polls that showed meager support for the Games. With Boston 2024 in free fall, Fish in May relinquished the chairmanship to Steve Pagliuca, a Bain Capital executive and co-owner of the Celtics, who vowed to reboot with a “2.0” Olympic plan. It was too late. The USOC was losing patience with the set-in-their-ways people of Boston. While Walsh backed the bid, Governor Charlie Baker stayed neutral, worried the state would be stuck with the tab. To Dempsey, the work of No Boston Olympics is done. Yes, the anti-Games coalition drew a spectrum of people — from progressives to archconservatives — but he says they’d be unlikely to rally around another issue. “There’s probably not necessarily consensus on ‘Well, maybe we should raise the gas tax a couple cents to help the T,’ ” says Dempsey, now a consultant for startup Masabi, maker of the MBTA’s commuter rail smartphone ticketing app. That is also the biggest lesson Fish learned: Democracy matters. While he doesn’t believe the Olympic experience has changed Bostonians, it has altered his own thinking. “It was a very humbling experience,” Fish says. Three decades of running a business in the private sector didn’t prepare him, he acknowledges, for dealing with the public process. An obvious question is whether the high-profile flameout of Boston 2024 might discourage others from pursuing a big idea here. Just take a look at how hard it is for Walsh to hold an Indy-style car race in Southie. We might all consider that thought as New Year’s resolution No. 1 — to take up the conversation about our future where the Olympics bid left off, not to let what we didn’t do define us. Fish and Dempsey got us started. It’s up to the rest of us to finish the job. Shirley Leung is a Boston Globe business columnist. Send comments to shirley.leung@globe.com and follow her on Twitter @leung.